Deputy commissioner of jorhat Assam has recently published the job notification for junior assistant 13 posts starting date of online apply 15 September. 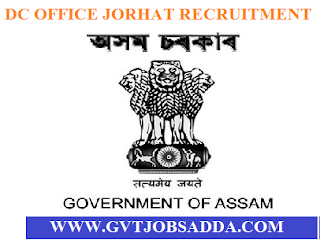 Those candidates who are interested in job vacancy in Jorhat They can read official notification and apply online from before 3-10-2018. QUALIFICATION : Degree (Graduation) in Arts/Science/Commerce/Agriculture/Management from a recognized University.